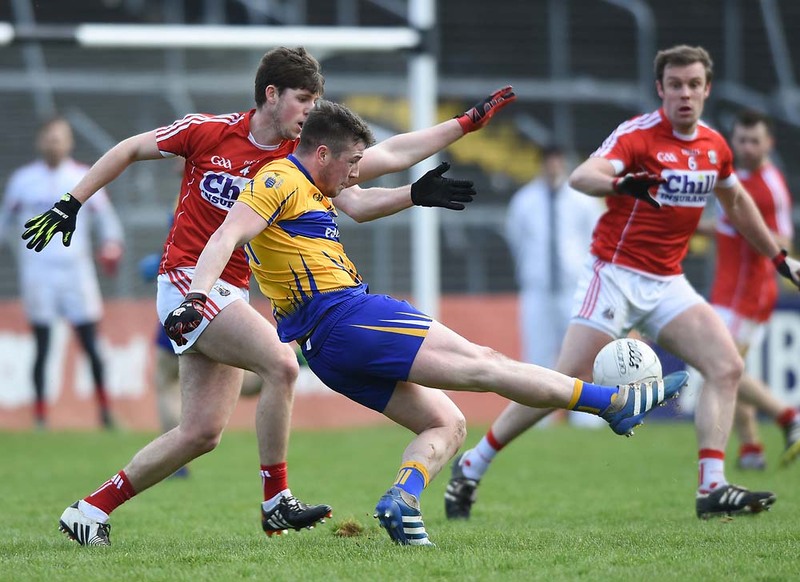 Brian O Driscoll of Cork in action against John Hayes of Clare during their National Football League game at Cusack Park. Photograph by John Kelly. AN outstanding second half display, during which Clare outscored Cork 1-9 to 0-4, helped the home county to their first league win over Cork in 23 years. The game was played in sometimes very challenging conditions in front of a crowd of 985 people in Cusack Park. Clare are now joint second with Galway in the division 2 table, on five points after four games. They are just a point behind leaders Kildare. Clare captain Martin McMahon felt that the panel of players were honest with each other following last weeks defeat to Galway in Salthill. “We worked really hard this week at training. We went back to basics and really got stuck into each other. 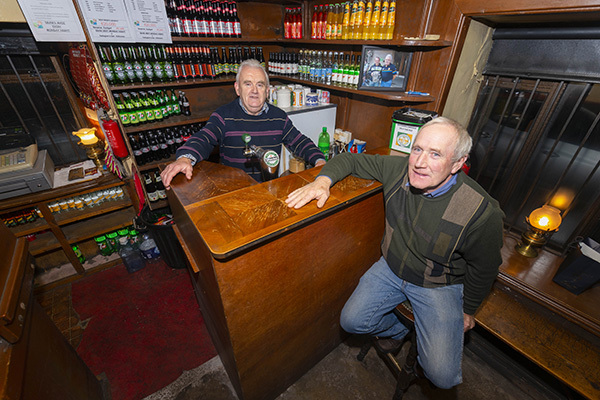 Tactics were right today and everyone just worked as hard as they could,” the Kilmurry Ibrickane man said. “Today we said that we were going to try and keep it nice and tight. I think our forwards worked really hard. There was no more diving in inside the 45. That worked really well for us today. 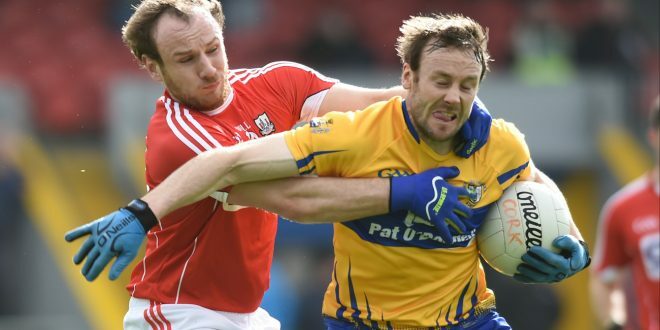 I think Jamie (Malone) had three or four turn overs,” he added as an example of Clare’s tackle count. Although Cork dominated possession in the opening 20 minutes the teams were tied at half-time. Points from Aidan Walsh, a Luke Connolly 45 and centre back James Loughrey, left Cork leading 0-3 to 0-0 after 21 minutes. While Cork had the vast majority of the possession they found it very difficult to penetrate a Clare defence, which regularly had 13 players behind the ball. Clare should have goaled again a minute later when Shane Brennan found Jamie Malone alone in front of goal. Malone pulled on hit but his shot was taken off the line by Cork full back Tom Clancy. Earlier, Clare midfielder Cathal O’Connor’s delivery, from inside his own half, had to be deflected for a 45 by Cork goalkeeper Ryan Price. While Cork virtually owned possession, Clare managed to created three first half goal opportunities. Points from wing back Tomás Clancy and a Niall Coakley free, left the teams level at the interval, following a brace of Eoin Cleary points for the home county. Clare started the second half with points from Shane Brennan, David Tubridy and a superb Cathal O’Connor effort, leaving them 1-5 to 0-5 ahead. While Niall Coakley and Colm O’Neill replied for Cork, Jamie Malone, Tubridy and Ciaran Russell did likewise for the winners. However Jamie Malone’s goal, four minutes from time, sealed an exceptional result for Colm Collins’ team. Cork meanwhile were left reflecting on a very poor second half display which included a Colm O’Neill penalty hitting the post in second half injury time. Clare’s next game is away to Fermanagh in Enniskilleen on Sunday March 19. Clare: Joe Hayes; Dean Ryan, Kevin Harnett, Martin McMahon (captain); Liam Markham, Gordon Kelly, John Hayes; Cathal O’Connor, Ciaran Russell; Cian O’Dea, Keelan Sexton, Shane Brennan; Eoin Cleary, David Tubridy, Jamie Malone. Scorers for Clare: Jamie Malone (1-1), David Tubridy (0-4, 2f),Cian O’Dea (1-0), Eoin Cleary (0-3, 1f, 1 45), Shane Brennan (0-1), Cathal O’Connor (0-1), Ciaran Russell (0-1).